Coptotermes lacteus (C. lacteus), or the milk termite, mound-building termite, or subterranean termite, is a species of Rhinotermitidae. Rhinotermitide is a family of termites that feed on wood, with the potential to cause significant damage to wooden structures. 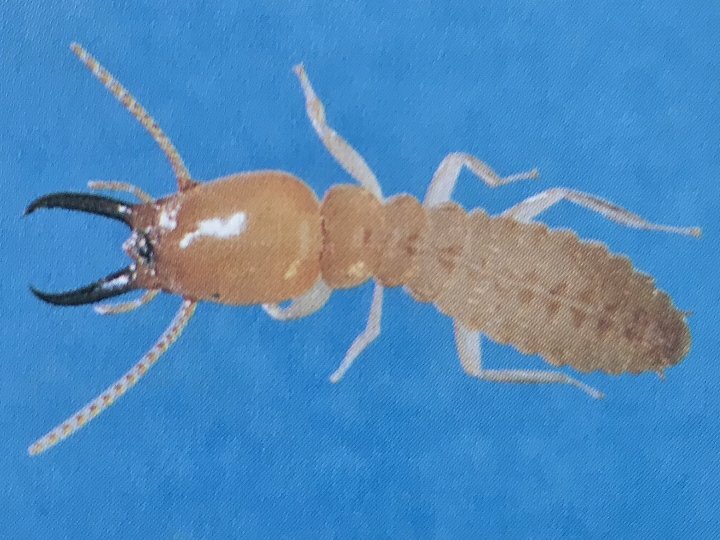 This subterranean termite is a social insect native to Australia. It is commonly found in eastern New South Wales, Australian Capital Territory, eastern and central Victoria and southeast Queensland, especially along the coastline, Great Dividing Range and western slopes. Identification of the C. lacteus is done through the soldier termites, which are the most distinctive of the insects due to their heavily armoured and pigmented heads. The different species of termites found in Australia can be difficult to distinguish from each other. Identification of the C. lacteus should be done by an expert, who will assess it based on locality, nesting habits, and measurements. The C. lacteus can otherwise easily be confused with Coptotermes frenchi and Coptotermes acinaciformis. Soldiers of both C. lacteus and C. frenchi have pear-shaped heads, while the head of C. acinaciformis is more rectangular in shape. Lacteus builds communal nests in mound-like shapes that can be quite large and conspicuous. Worker termites use the network of galleries extending from the mound through the surrounding soil to forage in the surrounding area, without needing to emerge to the surface. They are attracted to weathered wood as a food source and for this reason can be a threat to any such wood that is embedded or otherwise in close contact with the soil. lacteus soldiers measure between 4-4.8mm in length. Alates, including wings, measure between 13-16mm in length. Workers are whitish in colour, partially transparent. They are wingless, eyeless, and sterile. They have thin cuticles. Soldiers are cream in colour, with large heads (0.7-1.2mm) and mandibles with no obvious teeth. Soldiers are wingless, eyeless, and sterile. The labrum of the soldier is not grooved, the tarsi has 4 segments and the abdominal cerci has 2 segments. The soldiers have no anterior lobes. Soldiers tap their heads when disturbed and agitated, which can be heard as a loud ticking sound. Alates are dark brown to black in colour. Alates have compound eyes, larger heads (1.3mm) and denser cuticles in comparison with soldiers. Coptotermes lacteus termites undergo incomplete metamorphosis in the transitionfrom egg to nymph to adult. Nymphs may become either workers or soliders. When a termite colony reaches a greater stage of maturity, alates may be produced. Mature termite colonies may have up to 2 million inhabitants and can last for as long as 50 years. Worker and soldier termites are sterile and can be male or female. When alates mate, they lose their wings in order to become a new king and queen and establish a new colony. The habitat of C. lacteus is the mound nest. The termites construct elaborate mounds using clay, sand, partially digested plant material, excreta, and saliva. These mounds are large and well insulated and can be quite conspicuous, built up to 2 metres above ground level and extending up to 2 metres in diameter. The nest has a hard, thick outer wall of clay, which is unlike the brittle exteriors created by some other species of termite. Inside the mound, there is a mass of cemented soil particles and a softer area where the queen and developing nymph termites are found. The C. lacteus termite is not often found in urban areas and is regarded as a forest pest. C. lacteus mounds can also be found in pastures and roadside reserves. Coptotermes lacteus termites include weathered wood as part of their diet. The C. lacteus termite therefore attacks stumps, dead trees, fences made of timber and any other timber structures that are in contact with the soil and have been softened by weathering. C. lacteus also attacks softened timber in damp areas beneath floors, which can have a significant impact on structural integrity. The C. lacteus termite is primarily attracted to weathered wood rather than to sound timber. It represents therefore a moderate economic threat, but one that should be prevented. Home insurance does not cover repair costs, which can be substantial.